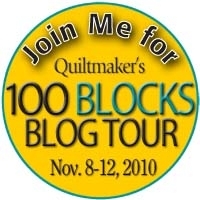 Windham Fabrics is delighted and honored to participate in the 100 blocks tour once again. Only 58 designers sign-up to partake in the event and this is the second time one of our designers received a block placement! 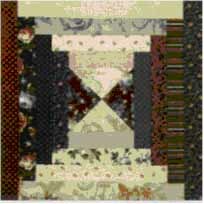 The featured block was made by Tavy Umhey from several of our Windham reproduction collections. Here at Windham we are so happy to supply Tavy Umhey with fabric so she could be a participant in the 100 blocks issue. Tavy has been one of our most prolific and diverse designers and we are so proud to support her efforts. 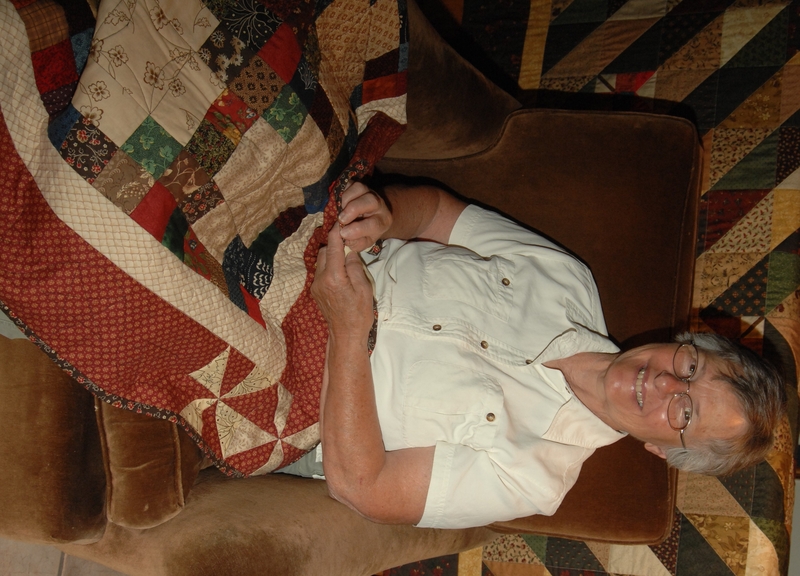 Enjoy reading more about Tavy and the creation of her block and quilts by following her on her blog Cheerful Quilts. http://www.facebook.com/#!/pages/Cheerful-Quilts/112440155485447 . 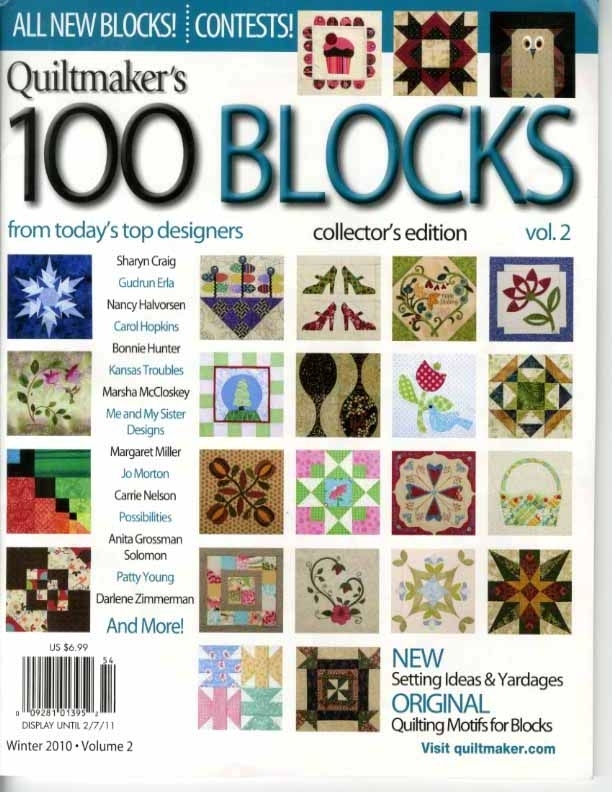 In addition, be sure to pick up your copy of Quiltmaker’s 100 Block from Today’s Top Designers, Collector Edition Vol.2 at your local newsstand this month or purchase the issue from www.Quiltmaker.com. The issue is so inspirational containing tons of amazing blocks of all different creative designs and quilting styles. Also, don’t forget to check out Windham Fabric’s on Facebook or on our website www.windhamfabrics.com. Below is Tavy’s quilt she put together using her block. The quilt is named “A Hero’s Welcome”. I sincerely adore it! We invite you to leave your comments and thoughts below and one lucky winner will recieve their very own issue of Quiltmaker’s 100 Block from Today’s Top Designers, Collector Edition Vol.2!!!!! SuzK you are the contest winner please email your mailing address to jennifer@baumtextile.com to receive your free issue of Quiltmaker’s 100 Block from Today’s Top Designers, Collector Edition Vol.2. Thank you all so much for participating!!! This makes a stunning quilt. Love the borders Tavy used;) Thanks for the chance to win! Log Cabins are one of my favorites, and Tavy’s layout is perfect. Love Tavy’s block and the dramatic effect it has as a quilt! I love the block. I can see it in so many color combinations. Thank you! I love the tribute to the Hero. What a nice idea. The quilt is very special.